Regime Superman looks over the result of an escape perpetrated by Plastic Man, and now every villain that had incarcerated is free again. The League sets about capturing the escapees once more, while the Batman makes outreach to the Flash's rogues, enlisting them in an effort to defeat Regime Superman. The Flash runs into trouble with some escapees, but Regime is able to assist him, but not before Doomsday arrives from orbit, and lands on the Flash's back. Doomsday moves to attack Regime, as he looks on in surprise at what has just occurred. Story - 1: It's never a good sign when you have to read an issue that hasn't been released yet in order to have the full picture. What is worse is that this in the opening of Year Five, and not only does it begin incomplete, but with a host of hackneyed tropes that clearly show Injustice: Gods Among Us ran out of ideas three years ago. A few years into most television shows, one can expect a few trite ideas to push out what little steam remains. The jump into the future, five years, at least. A total deconstruction of the main characters and setting. However, when a series has to resort to the Plot Coupon, it's well past time to hang it up... but Injustice is just trying to hang on and little else. Its audience is baked in, and with DC losing more ground each month to every other comic imaginable, a regular seller like Injustice is more than the dalliance that it should be. If not, after four years time, we would have seen the death of Batman, the complete takeover of Regime Superman, and whatever ideas may come of it. 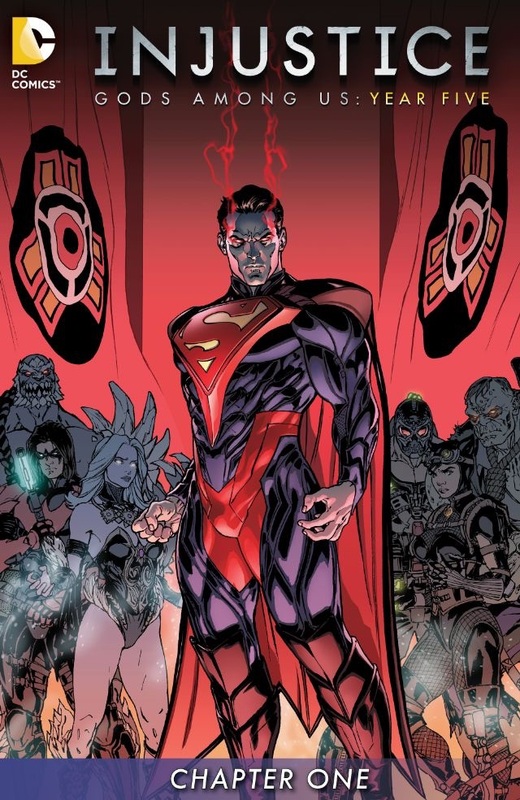 However, Injustice is a tie-in to a video game that has a definitive end, and so the four years of continuous filler could never amount to much more than service for the audience that has been starved of proper serial entertainment from what DC used to be very well known for: its superheroes and their legacy. Instead, an overlong Elseworlds, tumescent with errors, contradictions, and tripe has been given more development than the proper heroes and heroines it aims to reflect. Thankfully, it ends soon, though not soon enough, for if this issue is the lead for the year, it couldn't possibly be more retromingent. The "gotta catch them all" aspects of the book aside, you have to wonder what has happened to the Batman. He's enlisting Captain Cold, Golden Glider, etc., when he still hasn't tapped the well on the numerous heroes who remain that he could call to his cause. The man with the plan for everything has been reduced to illicit aid from those who he would have just as soon as locked up... and from those who cannot hope to help him. In every offering since Year Two, Batman has been scrapping the barrel for aid and come up with nothing. Not even a good plan. The only character worse is Regime Superman, who hasn't killed Batman on the numerous opportunities presented him. However, much like the Flash surviving a stomp to him back from Doomsday, and this is a Doomsday who fell from orbit no less, none of it matters. Flash will get better because he's in the video game. Batman will survive, Regime will... whatever. I could sympathize if Buccellato was writing to an enforced script, but he isn't writing at all. Writing involves thought, planning, creativity and more. Injustice involves none of these things. It exists simply because it fulfills a monetary need, regardless if it does so without purpose. Art - 3: Miller's linework starts interesting, then because less and less so as the book progress. Cover Art - 4: If nothing else, it is an intriguing cover.